Posted: May 6, 2010 in Food, It's a dog's life, or lack of. People born under the sign of the dog are said to possess some of the finest human traits; loyalty and honesty. I myself am one of the many born under the sign and while I hope I possess some of the finer traits I am certainly aware of my stubborn behaviour and my eccentricity also tells of The Dog. Dogs in Korea are an interesting subject, they can be eaten, they can be pets. Much like some of the A-list celebrities, being seen with a small ‘cute’ dog is seen as a great fashion accessory. And what better way to make a dog even ‘cuter’ is to wrap it in material; give it a jacket or boots, but if those things are out of your price range, you can simply buy some spray paint and paint your dogs ears and tail a bright neon blue, pink or green. 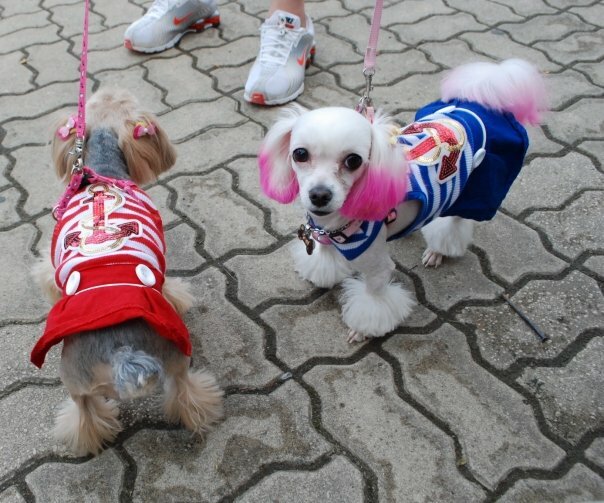 Yes, the dog as an accessory is the thing to have in Korea and the smaller the dog the better. When you go to some of the major supermarkets they can even accommodate for your little mutt by offering a tiny locker for them, so while the owner is shopping for rice and kimchi, they can be safe in the knowledge that their pet is secure in a semi-airtight coffin. When asking my students about their favourite pet, a lot of them will want a puppy, not a dog, a puppy. Walking around the streets in any major city you will see puppies ripped from their mother’s teat in a shop window waiting to be bought, barely able to open their eyes and yes, they certainly do look adorable and it can melt any Korean’s heart, but it begs the question what happens when the puppy is no longer a puppy and the apartment is no longer fit to house the once lovable animal, the clothes no longer fit the dog and the next size up is toddler. I don’t know the answer, but I do know Koreans eat dog meat. I have also posed the question to the same students if they would eat dog meat and a lot of them said they would. Certainly they are aware that a puppy is essentially a dog, I am just waiting for the next step when they think babies are cute. I came to Korea with the intention of trying all Korean foods and certainly I have tried a lot, but having lived in Korea and observing the treatment of animals, I feel I should draw the line on dog.